Extra Magic Hours are a perk available to people staying onsite at Disney World resort hotels, but we don't usually recommend them because oftentimes, Extra Magic Hours make the parks more crowded (which is definitely less magical). Here's an overview of how they work, who should use them, what attractions are open during those times, and suggested ways to tour if you do decide to attend. 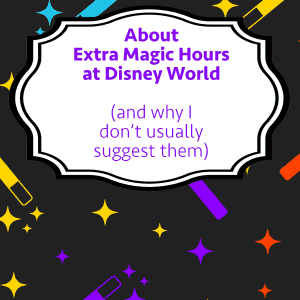 Are Extra Magic Hours and Early Morning Magic the same thing? What can you do during Extra Magic Hours? How does Disney know I'm eligible for Extra Magic Hours? How should you tour the parks during Extra Magic Hours? Extra magic hours are one of the many free benefits that guests staying onsite at one of the Disney World resort hotels receive. In addition, some offsite guests at select resorts are also eligible for this perk, too. Extra Magic Hours (EMH) are times that the parks are open to onsite guests outside of the normal operating schedule. Sometimes it's a morning EMH (where a park will open 1 hour early) and sometimes it's an evening EMH (which usually lasts for 2 hours). The parks offering EMHs vary from day to day, but you can check the schedule in the My Disney Experience app/website, or look on the monthly crowd calendars for the month you're traveling. The names may be similar but they are most definitely not the same thing. In a nutshell, Extra Magic Hours are free and open to only guests staying at a Walt Disney World resort (and some select offsite resorts). Early Morning Magic is a specially ticketed event that is open to anybody, however, it is only held at 2 parks: Fantasyland at Magic Kingdom and Toy Story Land at Hollywood Studios. Most people assume that the park is fully open during EMH, but that isn't true. In fact, there's actually just a subset of the overall list of attractions that are available. Magic Kingdom has both Morning and Evening Extra Magic Hours, however, the attractions available at each differ slightly. Beginning in October of 2019 Disney is not showing any Evening Extra Magic Hours on their calendars. This could be a temporary thing (due to the number of nighttime events and parties happening during that time period) or perhaps the end of the Evening EMH's, however, Disney has not formally announced anything either way. If you are planning on attending Evening EMH's at Magic Kingdom and you are traveling after September 30, 2019 be sure you confirm the EMH details when park hours are released at that 180 day mark. Epcot also hosts both Morning and Evening EMH's. Here's what you can expect to be available there. Animal Kingdom has Morning EMHs only. Like Animal Kingdom, Hollywood Studios has Morning EMHs only. Attractions that are available during Extra Magic hours can come and go, so before you get your heart set on something we definitely recommend you take a look at the current list of attractions offered on the official Disney World website. Want a list you can take with you? Save the image below to your phone for quick reference. Though it's mentioned as a perk of staying onsite at Disney World, we don't often recommend that people use them. The reason for that is due to the sheer number of people staying onsite; a bulk of them will see the EMH schedule and plan to go to that park, even if they don't wake up early enough or plan to stay up late enough to really enjoy it. In fact, the park recommendations on the monthly crowd calendars are based on avoiding EMHs for that reason. People visiting during super busy times, like Christmas or Easter week. If you take full advantage of the EMH and plan to hop to a park during the non-EMH part of the day, this can work well for you. People who will take full advantage and use Park Hopper tickets. If you know for sure that you will wake up early or stay up late to fully use the EMH and you have the Park Hopper option on your tickets to spend the non-EMH part of the day somewhere else, then go for it. You'll likely get some less busy time to visit attractions. The effectiveness of PM EMHs varies a lot - the later the park closing time, the better the chance of crowds being relatively light. Anybody visiting Animal Kingdom. When an EMH is offered at Animal Kingdom, it doesn't increase the crowds like it does in the other parks, so don't be afraid to visit, even on an EMH day. Late risers who don't want to be at the parks for rope drop, but want to arrive later and use PM EMH. Guests visiting shortly after a new land opens. When Disney opens up a new land or a highly anticipated attraction it isn't unusual for them to extend Extra Magic Hours to a daily basis for several weeks. If you are traveling when something major and new is opening (like Pandora, Toy Story Land, or Star Wars: Galaxy's Edge) you'll likely see Extra Magic Hours on a daily basis. In those instances, make sure you still plan to arrive to the parks before they begin (at least 30 - 45 minutes before the park opens for the Extra Magic Hours). Disney determines eligibility for Extra Magic Hours by scanning your wristband or ticket. And, don't think that you can plan on a pre-park opening breakfast and then sneak out to ride a few things before the park opens up to all guests. Disney makes sure that only guests that are eligible to ride attractions during Extra Magic Hours do so. FastPass+ is never offered during Extra Magic Hours. That's why Extra Magic Hours are sometimes a decent idea for people with Park Hopper tickets because you can plan to use your FastPasses at either the park you are hopping to next or the one you visit before you participate in evening Extra Magic Hours. If your plan is to stay the entire day at the park where you are attending Extra Magic Hours, it is best to make some choices ahead of time on what you plan to ride. We recommend that instead of trying to ride everything during Extra Magic Hours you focus on riding the attractions that will make your day go smoother. To make that easier to figure out, you'll want to start by having a good touring plan in place. One thing most people don't realize when planning to attend Extra Magic Hours is that there isn't any way to ride everything that will be open. That means you'll need to prioritize what you choose to do. Unless you are just looking for "bonus" rides on attractions, your goal shouldn't be to waste the Extra Magic Hours on attractions that are relatively easy to ride during regular park hours. Regardless of which Disney World touring plan you will be following, during the EMH you should focus your time on riding your must-do attractions (that you don't have a FastPass+ for) that historically have the longest lines. Then, whatever attractions you do during Extra Magic Hours (or plan to do in the case of Evening Extra Magic Hours), you can just "skip" when you get to them in your touring plans. 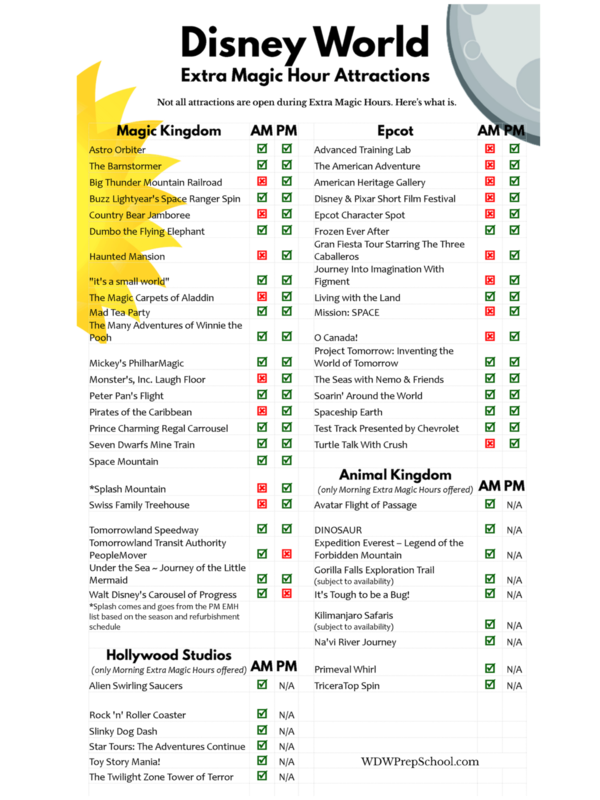 The attractions below on the ones that generally will have the longest lines during normal park hours so if you do decide to attend an Extra Magic Hours, we recommend you focus on these. Keep in mind, however, that there may be instances where it makes sense to ride one of the other attractions available that aren't listed below. If you get close to the end of Extra Magic Hours but the lines to the most popular attractions below are too long (and will make you late to rope drop the rest of the park), we recommend you go ahead and pick another of the less popular attractions that are open and are currently showing a low wait time in My Disney Experience. Note: If your plans for the rest of the day take you to an area of the park outside of where the Morning EMH is being held, you'll want to head towards that area about 15 minutes or so before the park opens to all guests. You'll be held by a Cast Member at a staging area (basically a rope drop inside of the park) until the park opens up and the crowds at the front are allowed in. If you wait until the park opens to head to a different area, you'll be behind the crowds from the front of the park PLUS all of the EMH crowds and that could definitely mess up your plan for the day. Lines for attractions will be longest right when Extra Magic Hours begin. To maximize your time, save the attractions with the longest line for the last ride. As long as you are in line before the park closes for EMHs, you'll be allowed to ride. If all the lines for the attractions listed below are long, consider killing a little bit of time on a less busy attraction to let the crowds thin out a bit. Note: Keep in mind, attractions can and do break down. You don't want to find yourself in a situation where you've saved the most important attraction for the very end of your vacation during the final minutes of an Evening EMH, only to discover that it has gone down and there isn't any way you'll get to ride it. If there is an attraction like that for your family, your best bet is to try to ride it at the beginning of your trip so that you have additional chances if something goes wrong. There are a few other attractions that, while not necessarily "must do" attractions, are ones that can see long lines later in the day. There are a few other attractions that, while not necessarily "must do" attractions, are ones that can see long lines during in the day. So are you planning to use Extra Magic Hours, or will you avoid them during your trip? We'd love to hear your thoughts in the comments. Disneyland in California closes at midnight and all guests (onsite or offsite) can stay until closing time. Why WDW closes at 8pm (Feb 2018 schedule), so early? Why only allow onsite guests the EMH? So the offsite guests have to exit the park by 8pm, even if we don’t go on rides? We always take advantage of the extra magic hours in the evening. Mainly because my daughter has autism and seems to get very anxious around the amount of crowds that can happen during the day. So for us it’s a nice time that she has a little bit more freedom in the park. We also really enjoy doing the extra magic hours when we go in the summer time and it’s so hot that we just don’t think that we can get a full day’s worth and we end up going mainly in the evenings anyway. Yep, that’s correct! It’s not open during Extra Magic Hours. Are EMH just for those staying on site or can anyone with a ticket for the day take advantage of them? I wasn’t sure if I understood right. EMHs are just for onsite guests. This is my first time going to Disney in 11 years, and I looked at the extra magic hours for the week in July that we will be there. I was disappointed to see only the morning hours as we would more enjoy the evening hours. Does anyone know why there are no evening hours the entire time we’re there? Is it possible Disney will add them on later? Thanks! There are evening hours on July 11, 12, 18, 19, 25 & 26. In my experience they do about 2 evening hours per week and the rest are morning hours. We love the EMH and always use them….when paper fast passes were available, then you had a much better chance of getting on the long wait rides with a FP, now with FP+, you often have to wait for the rides & you can’t get a FP for all of them–you have to choose (for ex. can’t get Rockin’ if you have Toy Story). We use morning EM for thrill rides…Space Mountain, Rockin Roller Coaster, Test Track, On an EM day at MK, we go to Space…ride it 3-4 times and an hour isn’t even taken up…this gives us our Space fix for the entire trip & we didn’t waste a FP on it…obviously, you can do other rides if you only do Space once…but this is how we use it…totally worth it for us. At HS we go to Toy Story (which we usually have a FP for as well later)…or Rockin (which we usually don’t have a FP for)…however, the wait times for Toy Story have been much better with the addition of the 3rd track…so maybe Rockin is a better option (again we ride 2-3 times before park opening)…we do the same at AK with Expedition Everest (and don’t use a FP+ or have to wait later)…sometimes riding 5 times in that hour…SO worth it for us. Dinosaur and K Safari are other rides we frequent during EMH. Nighttime EM hours are good as well…but mostly in the MK…I find HS isn’t that great (even though we do stay) because so many people are still in the park because of Fantastic or SW Fireworks and the EM hours aren’t that late… Yes, our days are typically long…and we go often (but short in length trips)…however, to ride the rides that we want to and multiple times like we like…EMH are the ONLY way to do this!! We stumbled upon Magic Hours last May and it was one of the best experiences we had on our first family trip to Disney! My 13 year old daughter and I rode Splash Mt 3-4 times in a row-with no wait!! We just walked through the roped off maze. Saw the light parade, fireworks…the entire thing was perfect. I think it is an awesome use of time and worked out great for us. I enjoy your blog:) Thank you!! I just wanted say that I think some of your information about the crowds is incorrect. We were just there December 7th – 12th. The crowds were outrageous. I’ve been there many times before and I have never seen it that busy. Everywhere we went it was wall to wall people. The average wait time for most rides was 90 minutes. Even some of the fast pass waits were long. Dining reservations were hard to come by, and there were long lines at the counter service restaurants. I bought only one souvenir because the lines were so long just to pay for it. I think more and more people are going in early December. We’ve gone to WDW every year for the last 11 and almost always plan to spend every possible moment in the parks. We’ve never left mid-day, not even when the twins were small (and we never had the crying, fussy kids either). I can only think of one time we left before a park closed and that’s when I was ill. I can count the number of times we’ve even seen our resort’s pool on one hand. I think our record is 15 hours straight at MK, rope drop to 1 AM with EMH. We’ve almost always had great luck with late park hoping over to a park with PM EMH. Practically deserted, which is great for our family of coaster addicts. My now-pre teens were riding BTMR at age 5. The exception was last year when we hopped to MK at 10PM after EP closed. So busy! It was crazy and frustrating. We’re late night people so making an AM EMH is brutal for us, but I wanted to say I made rope drop at least one time in my life. 🙂 So, in short, yes, we use EMH because we want to spend as much time as possible in the parks riding stuff, but I have noted the advantages of this decreasing in recent visits. We usually visit in January and like to do a second day at Magic Kingdom and use EMH for PM. We have lucked out numerous times with hitting rides right when the evening parade starts and the park closes to day guests. We have a family tradition of riding Big Thunder Mountain Railroad over and over. Zero wait times during low crowd calendar visits make EMH a great perk for those who love to sleep in a few days during their stay. During our trip last year we went to Magic Kingdom for PM EMH. Unfortunately, also everything closed the minute EMH started, including ALL of the restaurants and most stores. They closed everything at the back of the park and herded everyone toward the front. Which made a huge crowd in the hub and on mainstreet. We couldn’t even walk. People were just standing around because no one could get anywhere. We talked to a cast memeber we were stuck next to for 20 minutes and she told us that this entire mess was very typical. We were starving and couldn’t get food and didn’t get on any rides at all. We basically just lost extra sleep. BOOO! My experience may not be typical but it sure was lousy and we won’t do it again. I’m wondering if your advice on EMH is any different if we are going on a “Lightest Crowds” day in late January? We are going for our first trip to WDW, 3 days, with a 4-year-old and 6-year-old. I’d like to do Magic Kingdom on the Fri and Sun and Epcot on Sat. Magic Kingdom has morning EMH on Fri, but you also note that Saturdays are the worst for Magic Kingdom. 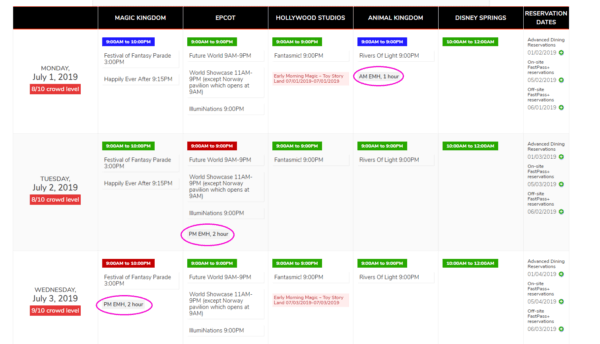 So I’m wondering what might be more crowded, a Fri with morning EMH (the only EMH during our trip window) or a Sat? Thanks for any additional advice you can give! Always take advantage of EMH morning or evening to get some of the rides that will have long lines later in the day. Rarely use park hopper but have at times. Are fastpasses offered during evening magic hours? I am planning to do both Epcot and MK during extra evening hours for our Spring Break trip! We have thoroughly enjoyed the extra hours on previous trips and it was my experience that the crowds were nonexistent late at night. The only problem I foresee is I might be too tired to last that long. We can plan to go slower in the morning. If FP are available, it should be a breeze! More time in the parks, is how I look at it. Especially excited that Epcot will be open late. Confused about AK and HS, that both seem to be closing around 7 & 8pm during Spring Break. This is exactly what we’ve done the past 4 visits and it works well for us! When the park hours were released for April 2017, I was so sad to see that Magic Kingdom has EMHs for both the Monday and Friday of our week-long trip. I was hoping to avoid them for the reasons you mentioned. However, I want to begin and end with Magic Kingdom and this outweighs the crowd prediction. It’s our first trip and my daughters are 6 and 4. I know Magic Kingdom will be the place they’ll want to see most. Wish me luck! I read that you can add park hopper while on site for the remainder of your trip. You might want to ask about doing that to see if you could use the EMH but not get trapped all day at a busier MK on the last day of your trip. This is super interesting! I feel like as someone who has read a lot about Disney, it’s almost always recommended. But, this adds new perspective to it! Thank you! No, people who make “which park/which day” charts almost always recommend avoiding EMH. It works in some cases, as the article says. Or, if you are really going to get up early and be there for rope drop on early morning EMH. Just be prepared to hop away midday when it gets crazy (assuming you have hoppers, without them I would skip early EMH parks almost every time) For evening EMH the park will often be crowded the entire day, those are fine if you either get a really late start and plan to stay for the entire evening EMH or hope over for the evening extra hours after doing another park for the day. Any book or article that recommends EMH every time probably isn’t a good source of information. Or just outdated maybe? ?